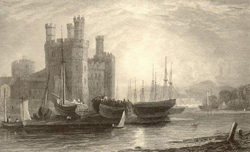 Town Councillor Hywel Roberts, who is a highly respected member of the Caernarfon Branch of the Gwynedd Family History Society, has launched the above book which is a result of his interest in his own Family History. This has meant years of research and the publishing of the book at this time is most appropriate, as we commemorate the commencement of the Great War of 1914 - 1918. 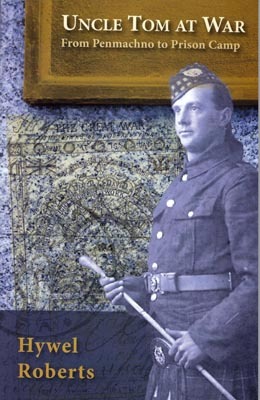 Thomas Williams, (1886 -1945) of Penmachno in the Conwy Valley, was the great uncle of the author, but the book is an achievement to all those who are interested in the trials and tribulations of the many, many thousands throughout the world who suffered as a result of World War 1. The main aim of the true historian be he or she an author of historic books, a teacher of history or of local or family history, is to bring alive to today’s people the lives of those of yesteryear and the period they lived though. In my humble opinion, the depth of the research put in by the author, together with the aid of numerous photos, post cards and relevant documents of importance, has succeeded to enrich this volume. Others should be encouraged to follow his example. Without risking giving away too much of the content of the book, I venture to give the reader a taste only. This book was written by a member of the family of a Welsh soldier, desirous of having his ancestor’s exploits in World War 1 published as a reminder to as large an audience as possible of the sacrifice created by sufferings caused by war. Thomas Williams, a tailor in Colwyn Bay at the age of 29, enlisted into the army as a volunteer on the 30th of November, 1915, shortly before the passing of the Conscription Act of 1916, when all men aged 18 -40 were required to serve in the armed forces. Tom was wounded twice; the first time he was sent to a hospital in England to recover, but he later returned to Europe, where he took part in the Battle of Ypres on the 31st of July, 1917; the day the poet Hedd Wyn was killed. Tom’s Battalion fought on and he himself was again wounded in the Battle of Cambrai on the 30th of November and was made a prisoner of war and taken to Minden Prison Camp in Germany, where he remained until the war ended on the 11th of November, 1918. However he had to remain there some time before starting on his journey home, and he eventually arrived in Britain on the 30th of December, 1918. Congratulations to the author on a thoroughly interesting and well written book.